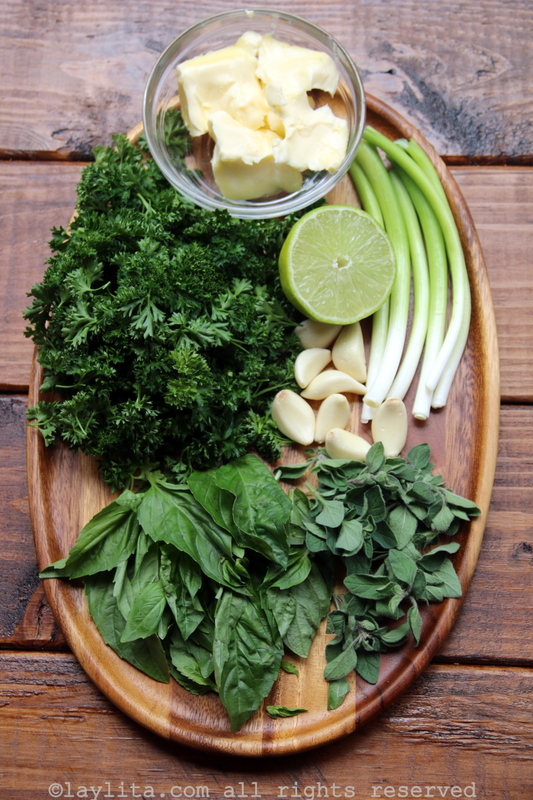 Chimichurri butter recipe made with fresh herbs -parsley, oregano, basil, garlic, green onions, chili pepper, red wine vinegar, lemon juice, salt and pepper. 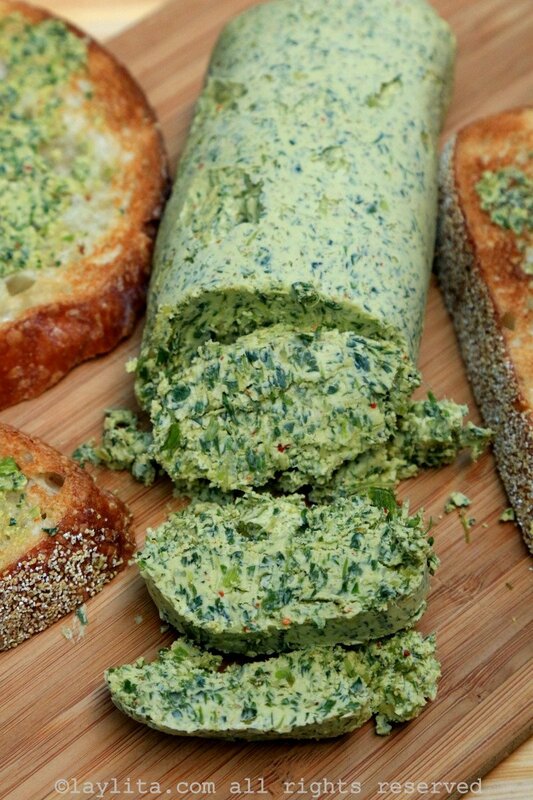 This is a super simple recipe for chimichurri butter or garlic herb compound butter made with fresh herbs such as parsley, oregano, and basil. This spicy tangy butter also has green onions, chili pepper, red wine vinegar, lemon juice, salt/pepper. 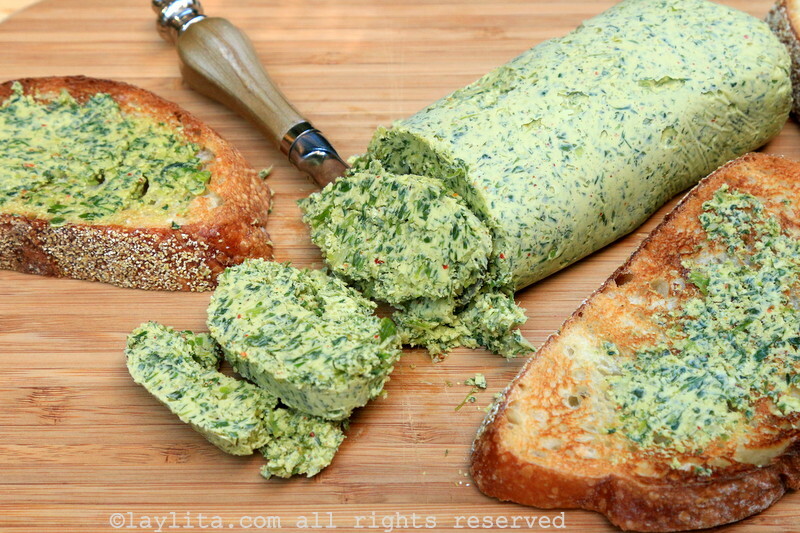 I originally made this butter to use as an ingredient for a roasted chimichurri chicken, but had some left over and ended up eating it with grilled bread. 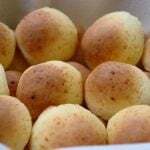 It’s very addictive and flavorful – try to resist the urge to eat it plain. 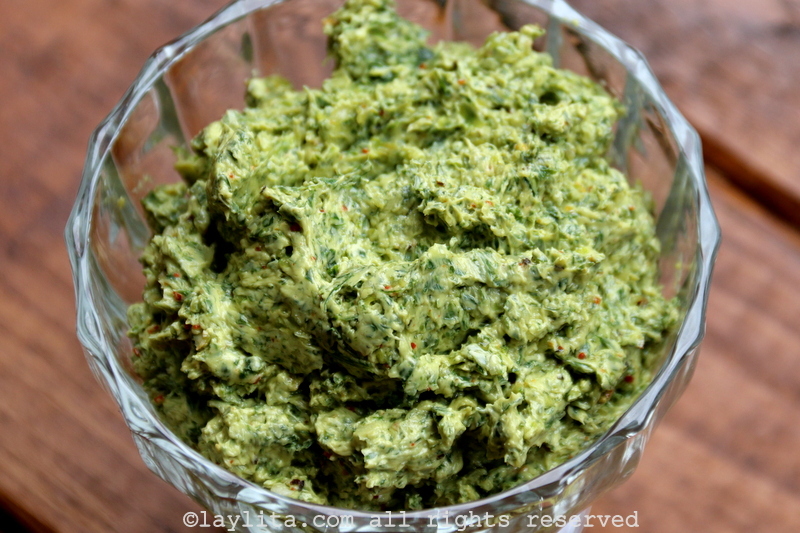 This chimichurri butter can also be served with grilled steaks or any grilled/roasted/seared meat. 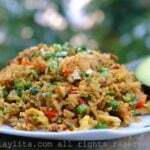 It also goes great with roasted vegetables and even seafood. It’s one of those condiments that can be served with so many different dishes. You can also easily replace and customize the ingredients according to your preference, for example you can add additional herbs such as cilantro, thyme, tarragon, etc. You can also omit the chili pepper if you don’t want any spiciness in the butter. I do recommend using fresh herbs, but if you don’t have any available you can also use dry herbs. 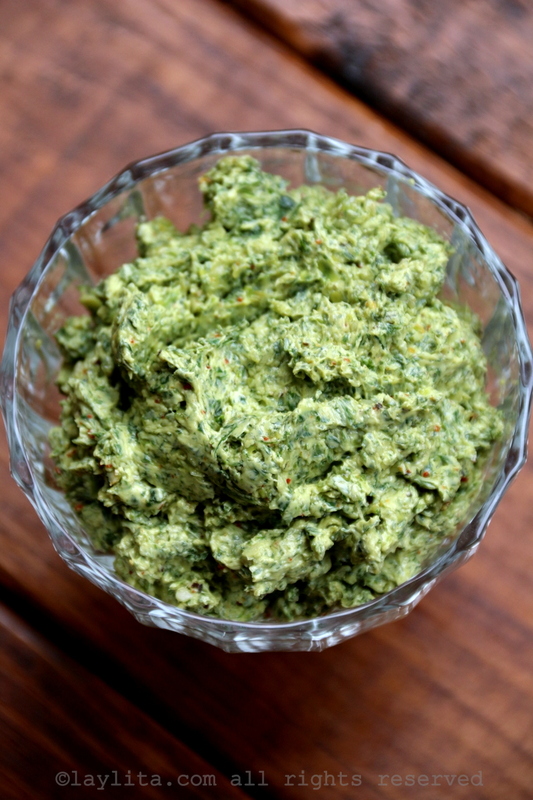 Easy recipe for a compound chimichurri butter made with fresh herbs -parsley, oregano, basil, garlic, green onions, chili pepper, red wine vinegar, lemon juice, salt and pepper. 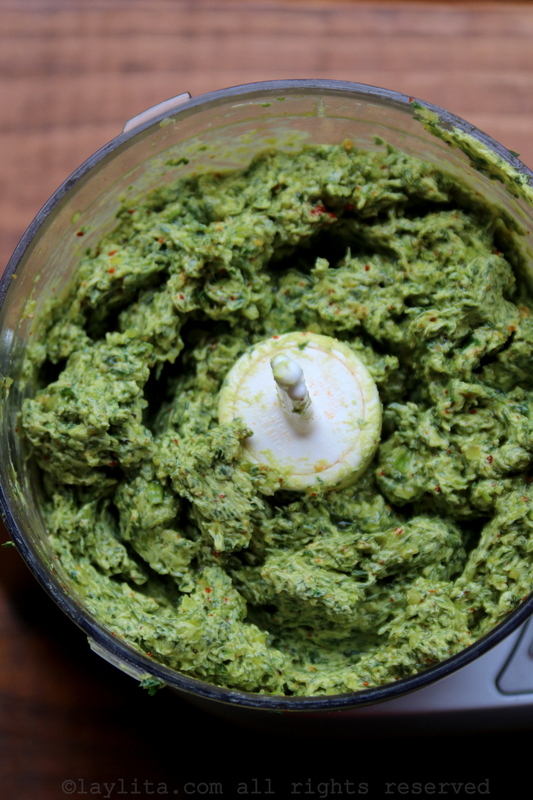 Place all the ingredients except for the butter in a small food processor and pulse until the herbs are finely chopped. Add the butter and continue pulsing until you have smooth creamy mix. 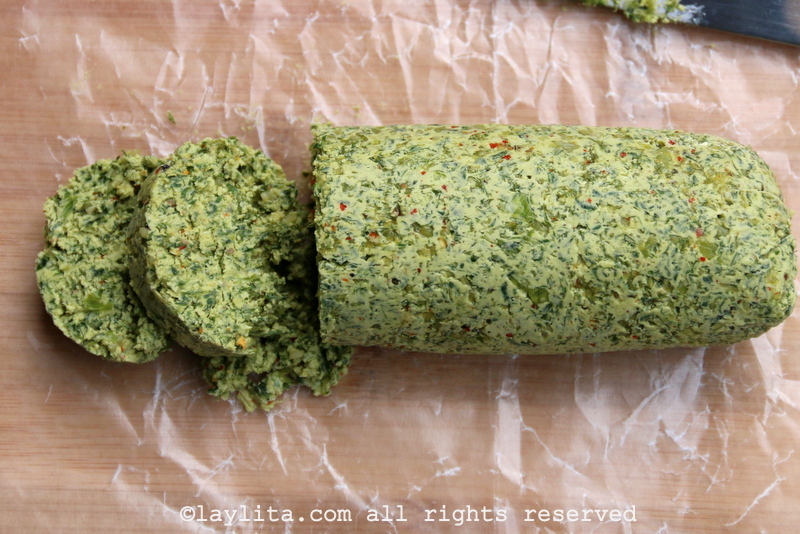 It can be stored directly in a container, or if you prefer you can place the soft chimichurri butter mix on some plastic wrap and shape it into a long cylinder form. Then seal and refrigerate the chimichurri cylinder until it solidifies. To serve it you can remove the plastic wrap and slice the butter as needed. Is this wonderful condiment freezable? What is its normal (refrigerated) shelf life with the fresh herbs? I only ask because it is only my husband and I at home right now, and I can’t imagine our eating two sticks of butter in one week!! Hi Emily – Yes, you can freeze it (for ~3 months). You can also reduce the quantities and make it with just one stick of butter (half all the ingredients).